Bouquets, Brollies, and Boutonnieres – Oh My! I mentioned in a previous post that my bridesmaids won’t be holding bouquets as they walk down the aisle and the groomsmen (and groom) won’t be having boutonnieres. This is because the weather may be what one would call stinking and stupidly hot. For the bridal party, who will be in suits, dresses, heels, and walking, standing, posing and smiling all day, the heat could be potentially horrendous. 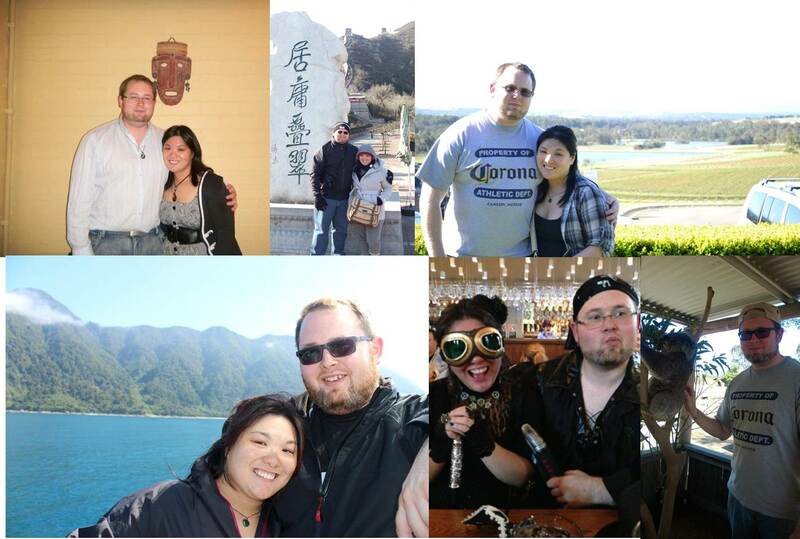 To add to this, half the bridal party are from the much cooler climes of New Zealand, specifically Christchurch (with one from Auckland). And so, with that said, we’ve decided that the groom and groomsmen won’t be getting boutonnieres as they’ll, likely, not be wearing their suit jackets for most of the day. In lieu of a lack of boutonnieres, the groom and groomsmen will have custom-made shirts that’ll differentiate them from each other! As for my girls, they’ll be given parasols to shade them from the heat. This way it’ll act as a twofold item – as an alternative to the bouquet to carry down the aisle, and as a way to shade them from the heat when we’re out and about taking photos and being generally bridal-party-like. 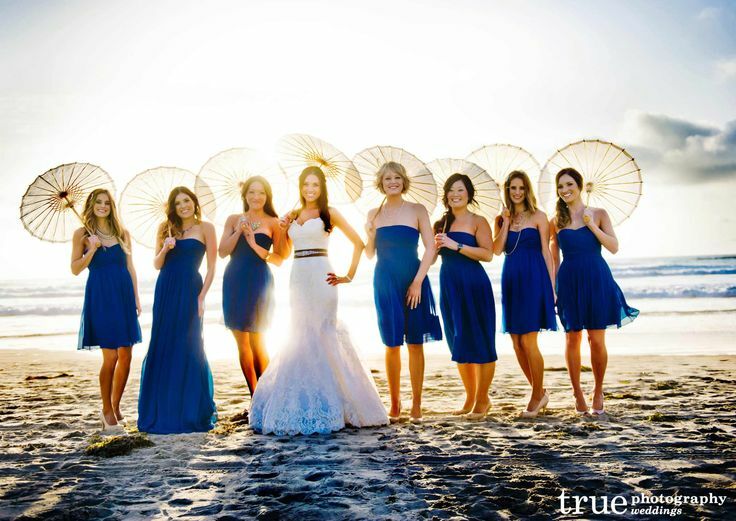 For those who aren’t convinced that parasols for bridesmaids are an awesome idea, look at this! 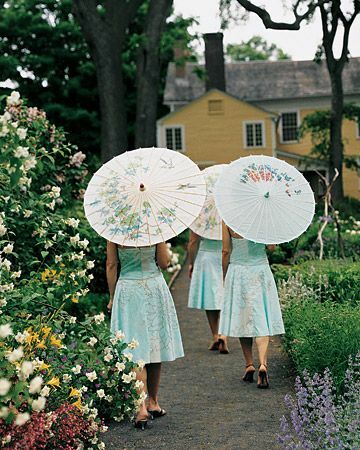 Bridesmaids carrying parasols, so dainty! 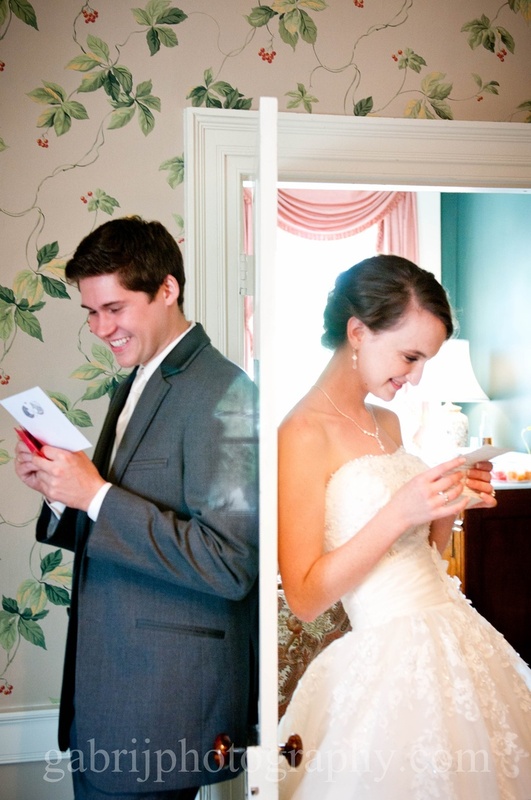 / Image via Martha Stewart Weddings. Parasols and blue dresses! / Image via Pinterest, photography by True Photography. We’ll be purchasing the shirts for the guys from this website as documented in this post. And the girls will be getting their parasols from Chinatown Online, an Australian website which sells relatively inexpensive parasols (as compared to the other websites). So what do you guys think? Was it a good decision on our part to skip the boutonnieres for the guys and bouquets for the girls? Nothin’ Suits ‘Em Like a Suit! – oh, and the right shirt! I made a board of different shirt combinations that may work for the groomsmen, best man, and groom, but Mr Big hated them all. They either didn’t fit the similar weave/fabric criteria or had patterns (and he hates patterns on shirts for formalwear). But let me show you some of these combinations, hive! 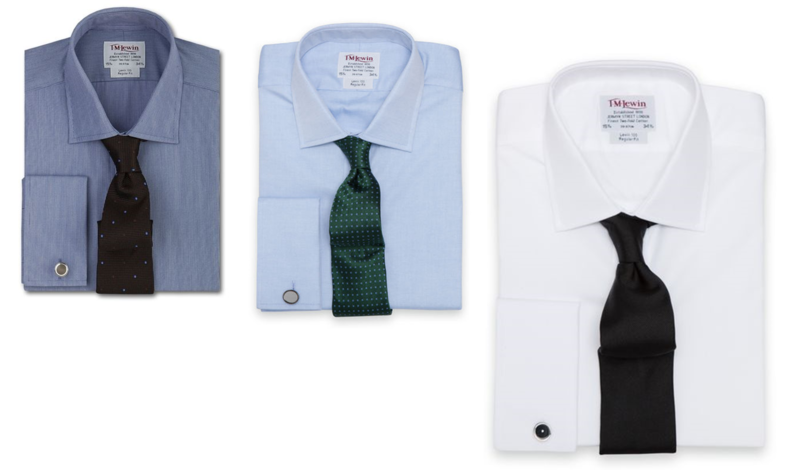 Plain blue pinpoint shirt for the best man, plain blue indigo poplin shirts for the groomsmen, white shirt for the groom. / Shirts via T.M. Lewin. My favourite one! 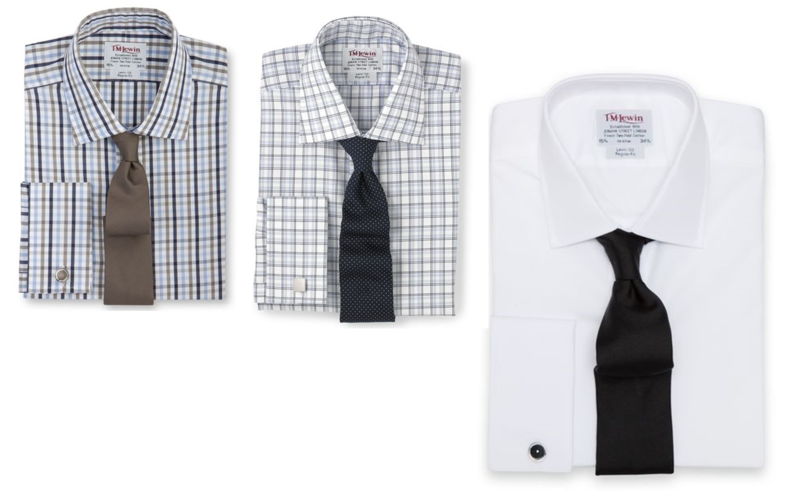 Chequered shirts for the groomsmen and best man, Mr Big in a white shirt. / Shirts via T.M. Lewin. You’re probably thinking, ‘what’s with the different-coloured shirts?’. The answer is simple: the weather. 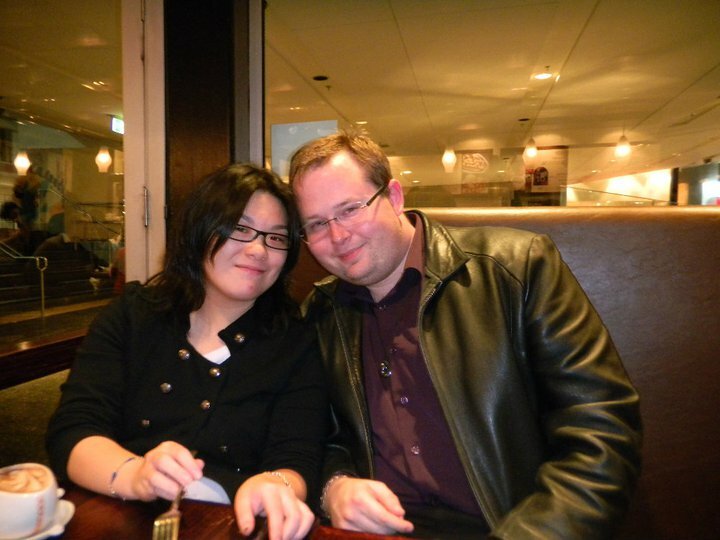 We’ll be wed in the middle of January 2014, in Australia. That means two things: (1) it is summer, (2) it is hot. From the projections I’ve been seeing on websites like Accu-Weather, this summer looks to be pretty mild (tops of 30 degrees, I’ll take that! ), but just in case it decides to be gorramn hot that day, we’ve opted for a ‘no-tie’ approach to our wedding. That means the groom, the best man and groomsmen won’t be wearing any ties/bow ties/ascots/etc.. We’re allowing them free rein (at least, I am, I don’t know about Mr Big) to accessorise how they please, but we’ve told them that they do not have to wear a tie. I know 2 groomsmen who are very pleased with the idea. So that, guys, is the reason why we needed different coloured shirts. Often it’s simple to add colour to the groom’s section of the bridal party by adding in ties, bow ties and/or pocketfolds, but with our no-tie approach and their jackets off for the majority of the day, the “regular” method to add a pop of colour is out. So shirts was the way to go! Now, I know one might think ‘Pft, shirts, easy!’. Well guys, it wasn’t. Finding shirts in three colours with a French cuff is hard. We looked at every possible department and men’s wear store in Christchurch, New Zealand and in our area of Sydney, Australia, and we.found.nothing. 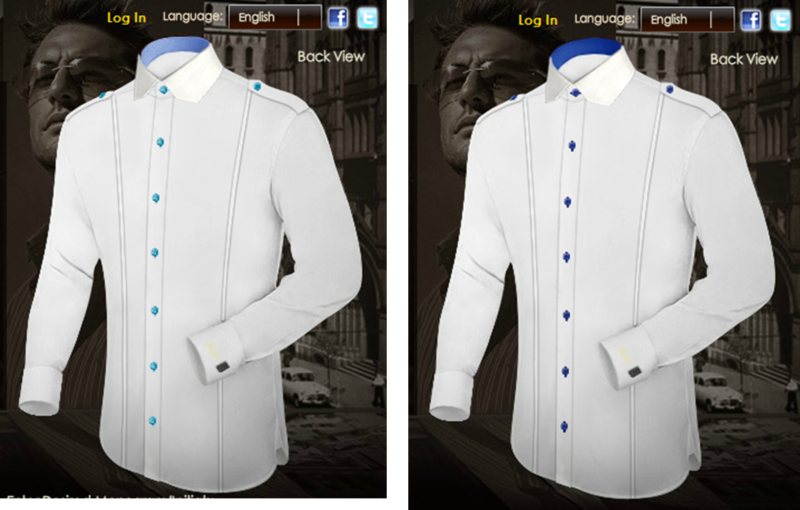 Every shirt we did find that had a French cuff only came in two colours: blue and white. Or three colours: blue, white and purple. It became sort of a desperate thing for me, and at one point, I was totally angry at men’s fashion simply because it was so hard to find these shirts. (Mr Big thought I was being a lil’ ridiculous – confession: I was). Before long, I resigned to the fact that I was not meant to worry about this detail of the wedding planning and left it up to Mr Big. Although, it didn’t stop me from investigating options whenever we go to department stores and whatnot, but I knew that actively searching for it would yield nought. Mr Big would say to me, “don’t worry about it, it’ll all work out in the end”. And you know what, guys? One fateful day, Mr Big got an email from our ‘friends’ (not really) at OurDeal.com. ‘Our Deal’ is basically a deals website, which gives you discounts on restaurants, holidays, spa treatments, and anything else you can think of. The particular email sent to Mr Big talked about a website called A-Tailor. 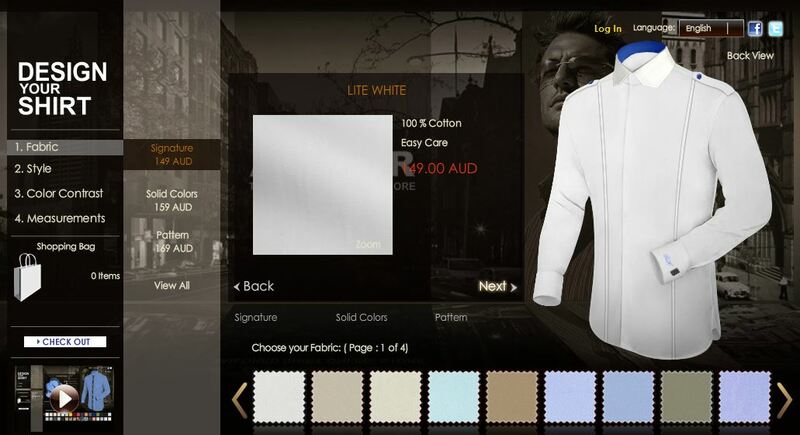 It explained that, for $50, you can receive a fully customised plain shirt. The design-your-shirt utility on the website. / Image via A-Tailor. We tried not to get too excited over dinner, but once we got back home, it was WEBSITE TIME. 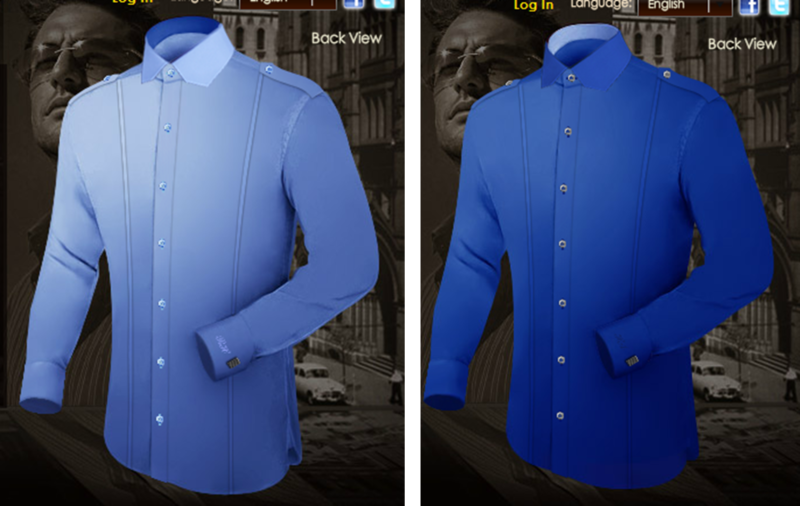 Perusing through the options on A-Tailor, you can choose every.single.detail you want for your shirt. It’s an extra $10 to have the shirt in a coloured option (like, for example, blue and dark blue) but it still works out MUCH cheaper for us because of the vouchers we bought! 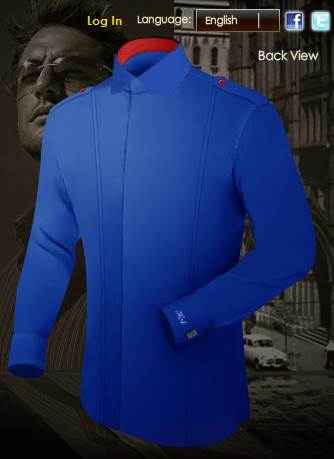 An example of a coloured shirt from A-Tailor. Can you see the monogram? They do MONOGRAMS! / Image via A-Tailor. At Mr Big’s request, I made a few options of what I liked and sent them through. When I showed Mr Big, he was quite pleased with my ideas. Best man in a light blue shirt and groomsmen in dark blue shirts, both with french cuffs. / Image via A-Tailor. Best man and groomsmen with white shirts, but blue accent, both with french cuffs. / Image via A-Tailor. We sent this idea off to the groomsmen/best man to let them know what we were thinking of doing. We got a resounding ‘yes’ from all of them, asked for their shirt sizes (you can custom-size it to almost exact measurements) and then ordered them over a period of a few weeks. We even got a shirt for Papa Bighorn, and it looks schmick. 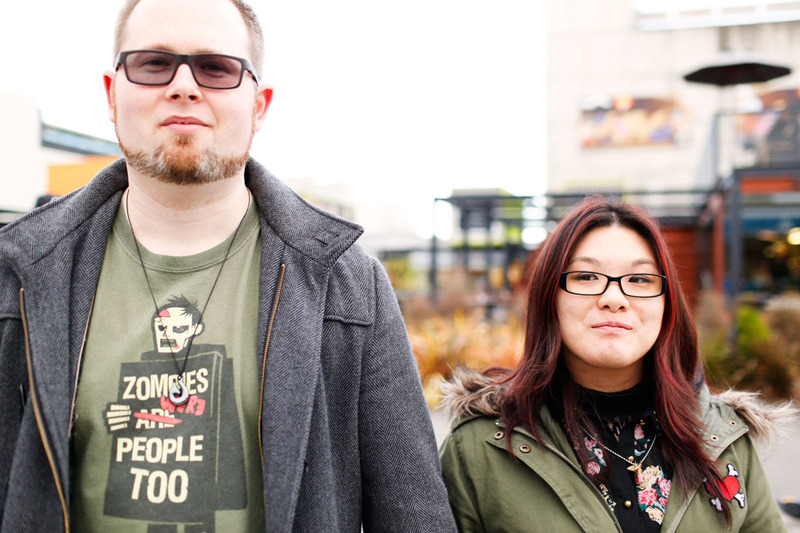 We finally got the shirts one-by-one last week, and it’s safe to say, we’re uber happy with them! We’ve come across a mishap with Mr Big’s shirt (I sized it wrong, doh!) so we had to buy another one, but hopefully, hopefully it all works out! Unfortunately, I don’t have any pictures of the guys wearing their shirts, but you’ll definitely see them on the day. Overall, I’m so frakking happy that Mr Big found this website (or more correctly – that Our Deal sent the website to Mr Big)! Who else spent a painstaking amount of time on a detail which resolved itself in the end? Parka – Check, Coat – Check, Scarves – Check, Birthday present? Two more days ’til we fly, and I’m excited! And also, stressed. Why is it so hard to pack for winter!? I think I’m just worried we won’t fit everything, but I’m pretty sure my doubts are unwarranted and unfounded. This here is a list of things I’m bringing over to Kiwi-land. It’s not complete, ’cause I’m not sure what GP wants to bring over, but most of these are for a colder climate than Sydney. Right now it’s about 9 degrees there, compared to the local weather of 16 degrees here. So yeah… I’ll be freezing my badonk off. We’ll also be hitting the snows as well as the Hot Springs in Hanmer Springs, where GP has informed me that it will be SNOWING. I’m UBER excited! Assorted tights, thick socks, underwear and thermal wear! I’ve also packed GP’s birthday present in the suitcase. I know he reads this blog, but he doesn’t know what the birthday present is, so I’m safe in the knowledge that he won’t find it! Hahaha! MINE IS AN EVIL LAUGH! MINE IS AN EVIL LAUGH!! I woke up at 5AM this morning to go to the gym and I. am. exhausted. Realistically, I should’ve had a power nap this afternoon, but got caught up playing Dragon Age: Origins. Now that my exam is done and all my assignments have been handed in, I should be focusing on my thesis work, but no. Tomorrow I’ll have to buckle down and get to writing my Introduction and Lit Review as well as finally getting an ENTIRE month to code those gorramn interviews. As for wedding news, we’ve got (most) of the guest list sorted, which is GREAT. We sent out our invitations early, purely because we have guests who may be coming from overseas (Canada, the UK, Indonesia, and NZ). It’s still 7 months until the wedding, but that’s ok! GP and I were happy that our invitations were out of the way and we don’t need to worry about them! I’ll have to have a full-fledged “making of” the invitations later on, but right now, this post will talk about wedding clothing. We have succeeded in getting most of the clothes for the important members of the bridal party! I’ve been absent recently because of one thing: exams. 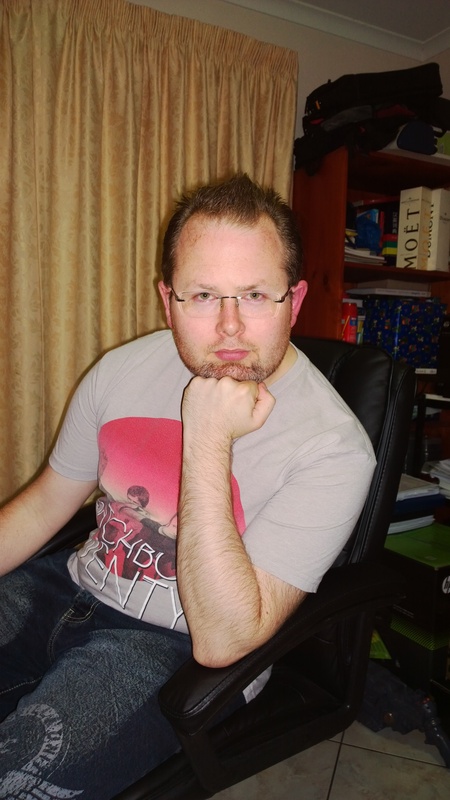 You see, I’m a full-time Masters student – I’m doing both coursework and an Honours degree, so effectively I have a full-time job that doesn’t stop. Luckily I get to study from home, but one of my subjects had an exam which I’ve been studying copiously since the beginning of last week. I’m happy to say that I have finally done it and I am FREE! It wasn’t too hard, but I know if I hadn’t have studied, I wouldn’t be feeling as calm as I do now. Since GP and I have completed about 80% of the big ticket items, the one thing we need to settle is the clothes for the wedding party. Well, I’m happy to say that we’ve officially got the suits for the men! 🙂 Connor, a men’s store here in Australia, were having a sale on suits – and may I mention, snazzy looking suits! Because GP and I will be buying the bridal party’s attire, this was just the BEST time to be buying it. The particular suit we wanted for the handsome groom and his groomsmen was called the Grand. It’s a slate-grey suit with a sleek maroon lining and nice black lapels. GP tried it on and he looks GOOOOD (I could be biased…). At the same time, my daddy bought his suit! His suit is called the Berwick. It’s a darker gray than the Grand and the suit that GP’ s dad is wearing. My dad tried it on with a waistcoat and the pants and it’s AMAZING on him. I can’t wait to see him all fully-duded out. Now all we need is to get double-cuff (French cuff) shirts for the men in the colours we want and we’re set for the guys! As for my girls, I’ve got my measurements for my two sisters and I’m awaiting the rest of the measurements from my girls. I’ve given them the rough guide on getting these measurements and am hoping to get something ordered before June 20. There’s a sale going on right now which will be great for my wallet, hahah! My own first dress fitting will be this coming Monday, so I’m ecstatic about that! All of it is finally coming together and I’m getting super excited! My fiancé is a snappy dresser. Because it’ll be the height of summer, Mr Big has settled with a lighter-coloured suit. 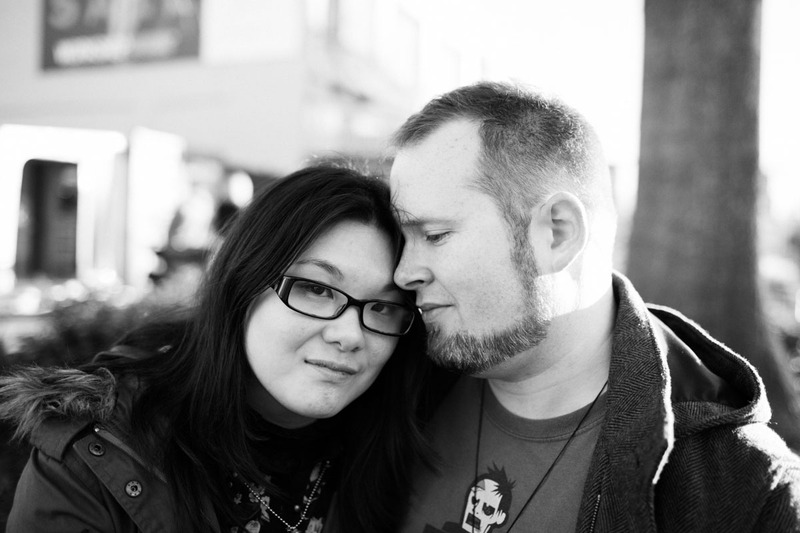 Most of the wedding will be under cover, but during photography, we’ll have the sun beating down on us. Mr Big has since told me that he doesn’t intend to wear a suit jacket because of this, of which I agree wholeheartedly. The jacket will be a prop – something to sling over his shoulder during photography. The fabric that we’ve settled with is cotton – which is light and breathable in the heat. It’ll hopefully negate most of the heat. He’ll also be wearing a vest over his custom-tailored shirt (more on that later!). The guys won’t be wearing boutonnieres (bouts) but we’ll be getting some for our father-ofs. Like this! But without the boutonnieres and ties. 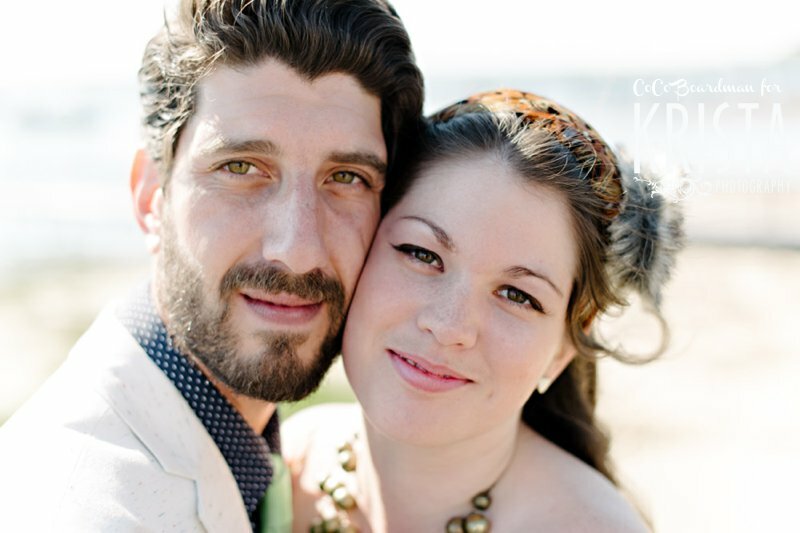 / Image via Swann Soirees, Weddings and Social Events, photography by Bauman Weddings. 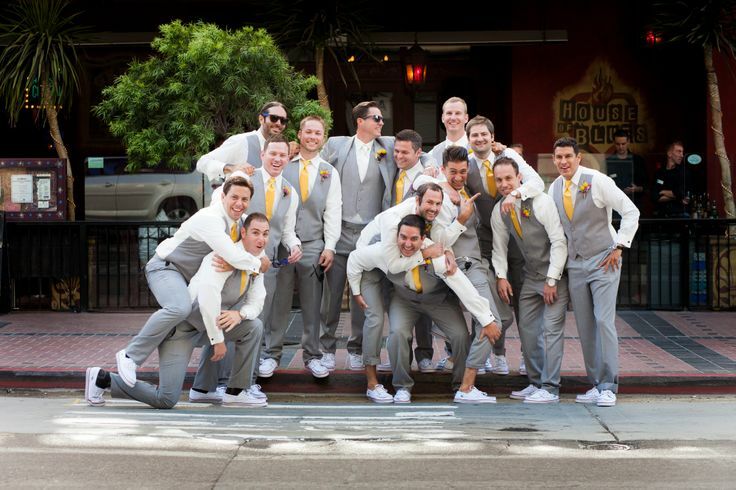 When we first started thinking of the groom and groomsmen wear, I was stumped! I’ve never been very good at fashion and men’s fashion is completely out-of-my-league, so I was completely out of my depth. Mr Big, however, is very good at knowing what to wear with what. When we went shopping at the local “supermall” back in November 2012, Mr Big was explaining what would look good with what and what he wanted. He knew what he wanted to go for and it impressed me. I always knew he had a good eye for things, but seeing it in action during shopping was awesome. Unfortunately, that trip didn’t yield much in the way of results. We basically jumped from store to store, tried a few things on, grabbed some ideas, and left for dinner with Mr Big’s Auntie Pen and Cousin Em who were visiting us from NZ. However, 6 months later, during a trip to DFO (Direct Factory Outlet) with my family, we were searching for the perfect suit for Papa Bighorn. During this trip, we came across a huge menswear store – Connor. Connor is a franchise of menswear stores spotted all over Sydney. The store at DFO were having a sale, and being in the market for new suits anyway, Mr Big and Papa Bighorn checked it out. Now, early in our relationship, Mr Big had expressed dissatisfaction for all things Connor. The shirts were for smaller men, the suits were for smaller men, the customer service he experienced was utterly crap-tacular, etcetera and etcetera. So it was puzzling when Mr Big paused in front of this store. I figured, however, that he was doing so for my father, whose build is rather small. However, Mr Big came across a suit that he thought would fit himself and his groomsmen. Enter the Grand. The three-piece Grand slim Suit. Image via Connor. It’s a nice slate grey with a maroon lining. It’s not too formal for the wedding and because there’s a vest, they don’t have to wear that suit jacket all day. He tried on some jackets at the DFO store, and after losing a lot of weight at that point, the suits fit him nicely. He talked with the friendly clerk there who gave him more information about wedding party purchases and Mr Big then proceeded to text all of his groomsmen. A few weeks later, we got all the sizes for the groomsmen and we headed off to our nearest Connor store (thank goodness for franchises). We talked to the ultra-friendly 2IC there, who went through all of the options, including ordering sizes one bigger and one smaller just in case the sizes that we were given weren’t correct. After a few weeks, the orders came in, and I snapped this picture! A happy, but loaded-up, Mr Big! / Personal image. During our whirlwind New Zealand holiday/ e-session trip, we took all the suits over to the Kiwi guys and hit a small bump in the road. I won’t go into specifics, but you can say the Bighorns thanked their lucky stars that, (1) the 2IC ordered one size bigger on all the suit parts, and (2) a big department store in New Zealand sold Connor suits so the guys could get their true sizes in slim-cut suits. 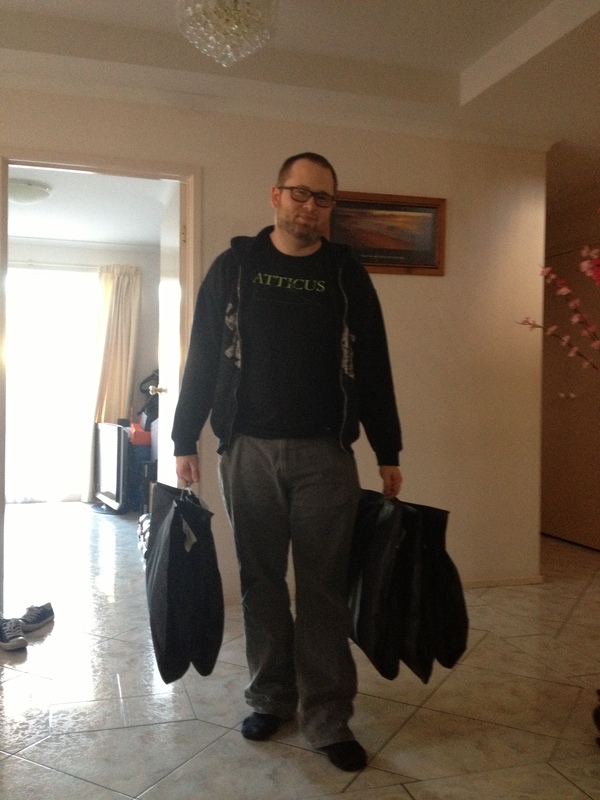 Back in Australia, we picked up the correctly-sized suit pants, grabbed a coffee, and voila! All we have to do now is ship across the correct suits so that the groomsmen in Kiwi-land can get their alterations done. And before you guys go away, yes, Papa Bighorn did get himself a suit. Wanna see? Told you he has a smaller frame! / Personal image. 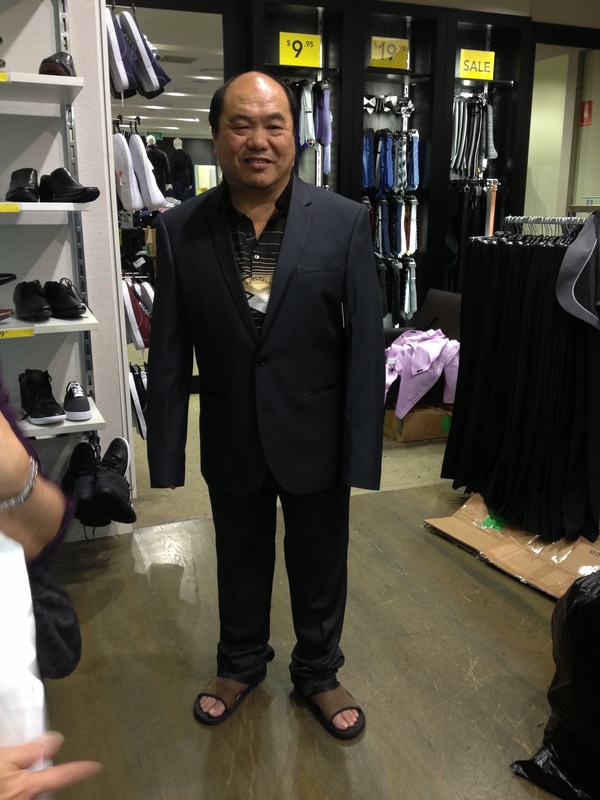 My dad’s suit has since been altered and fits him nicely! Next up, I’ll tell you guys about the shirts! Did anyone else find themselves turning to a retail store you didn’t expect? Who else has a fiancé(e) who had their own ‘vision’ of their wedding suit?